That’s a lot of J’s. And a lot of topics for one post! I’ve just completed a quick trip to the other side of the world – and it really did feel like the other side of the world which actually I luckily love about travel. In fact I prefer it. No point flying 14 hours if you land and it just feels the same as where you left! South Korea and then Japan make you feel like an alien landing on another planet where everything looks, feels, smells and sounds different. It’s hard to describe other than to say ‘try it’ if you get a chance. There aren’t many places left where you still struggle as a visitor – where they really don’t speak great English and everything takes precision planning or you end up lost. And bizarrely I love that. 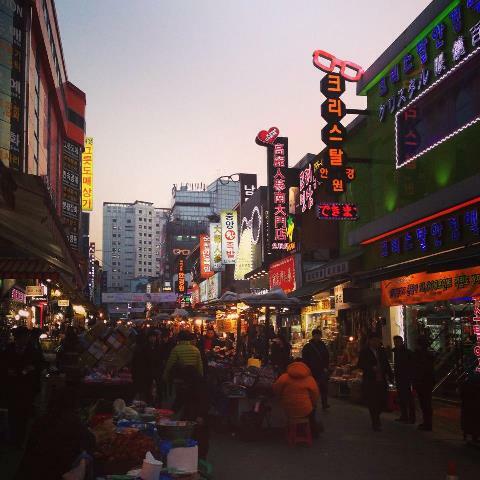 I have been to South Korea three times before so I at least felt arriving in Seoul that I had my bearings but alas no. It really is a phenomenally huge city and wherever it was I stayed this time I’d not been to before. I do feel it may have something to do with having travelled for 27hrs before actually getting to my first bed! What was originally going to just be a trip to Japan became something different when we decided to look at South Korea retail and possible opportunities for JoJo. Annoyingly flights couldn’t be changed to fly directly to Seoul so I still flew to Tokyo first and what I thought would be a quick terminal change and connecting flight ended up turning into a 5 hour delay before a 3 hour flight. It worked on paper just not in reality. As a result, despite the tiredness, my body told me it was time to wake up not sleep. The advantage I find of travelling that far with such a big time difference is it’s then about taking advantage of the jetlag! If you’re laying wide awake at 4am – don’t fight it – get up and do something. Go somewhere. Experience where you are! Anybody who knows me well knows I believe “you’re a long time dead” so whilst of course it’s tempting to give in and retreat to the cosy hotel room – especially if you’re travelling alone – I’m not into that at all. How can you ignore an amazing city outside especially if your body clock says it’s ok! To squeeze in dawn food markets and traders is an experience you can’t beat. To walk around a silent, beautiful preserved old part of the city and have it all to yourself is priceless. 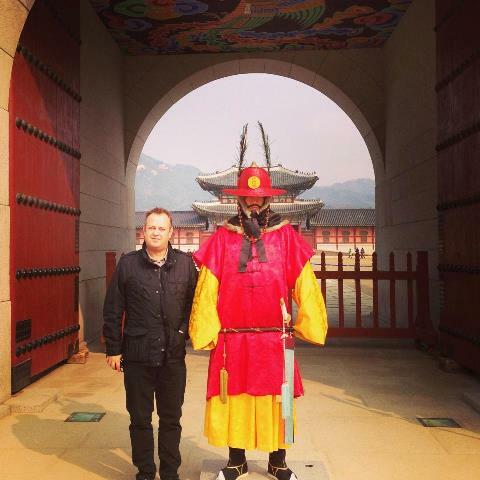 To snap a photo of yourself next to a guard before the start of the Gyeongbokgung Palace Gate flag changing ceremony with no tourists around is almost impossible. But not if you do it at 6am! As I start to head back to my hotel to get ready for the first meeting at 8am I see this really vibrant, fabulous city come alive – though it feels like the older generation have been buzzing about since I was up and about at 5am. The beauty of having a friendly taxi driver to stop and take a photo just when you need it! 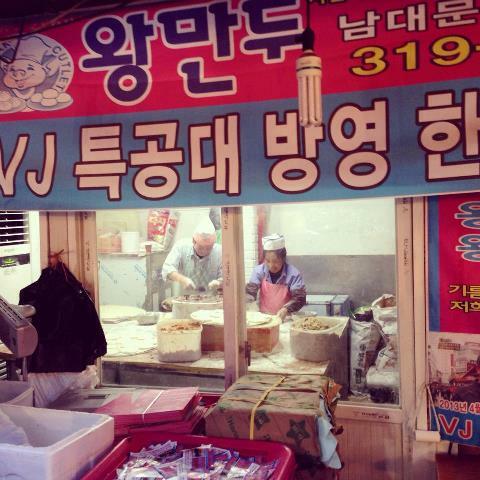 Korea is not what people expect. The UN are saying that by 2020 a quarter of the population will be over 60 years old. In fact it will apparently have the oldest population in the world by 2050! This will and is having an impact on how the country works. The ageing population will mean the size of the workforce will really start to drop, with manufacturing and skilled work in the country declining and importing of everything increasing! South Koreans are apparently going through some big socio-economic changes too: many more women in the workforce, downsizing of the family, a well-travelled generation. As a result, products and businesses that offer good value, high quality, health or nutritional benefits, new taste, and convenience are showing a strong growth in the market. And as with Japan, the low fertility rate leads to many families only having one child, so there exists something in Korea called ‘little emperor syndrome’ where the one child they DO have they absolutely spoil rotten! So they like to shop. Other than Japan, I haven’t really experienced so many shops in one place. Their department store business is established and strong. In fact their main store ‘Shinsegae’ which has been around for years owns the biggest department store in the world. A little fact Macys seems to ignore…and they adore children’s clothing and European brands. How very convenient. So in 48 hours I met with several interested companies who want to buy JoJo for their stores and websites or who want to represent us and distribute for us. Watch this space!! Back to Tokyo for my annual visit to support our distributors there at the achingly cool and trendy Playtime trade show in Tokyo. 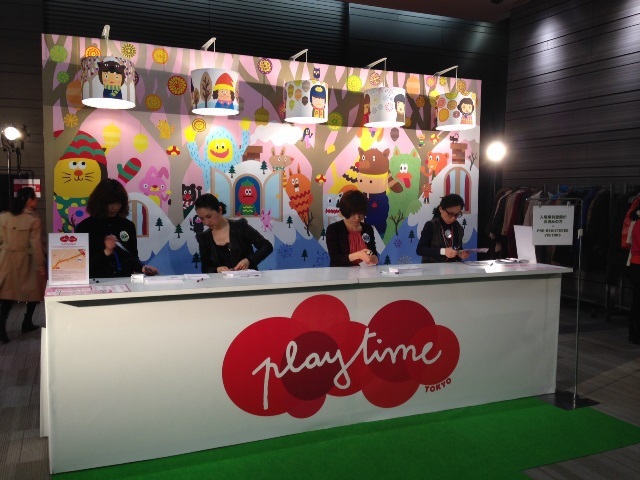 Playtime really is a different type of trade show with every booth trying to outdo their neighbour on a creative perspective. Every single retailer who buys kids and maternity clothing comes to the show. They also come back at the end of the second day for the drinks reception which this year had a grand opening with a brass band! But this is an international affair and I think I counted as many French, Italian and American brands exhibiting here as Japanese. Equally the visitors to the show come from HK, Australia, China, Taiwan and Malaysia. It’s always very ‘showy’ and ‘arty’ in a way that I know many would call pretentious but the argument is “fashion and design is art” so there are three or four installation art spaces and this year a dark room where every booth was encouraged to ‘do something fabulous’ with small handheld lights whilst being photographed by a camera with some fancy setting. You’ll see our contribution below! It’s rather funny coming to this show with all the important CEOs and directors of huge corporations and department stores wanting to have their photograph taken with me. “The man from London is here”. How can I not love that? What I wasn’t expecting however was the sudden frisson of excitement and paparazzi style rush of photographers and film crew on the second day. With no warning, we suddenly had one of Japan’s hottest celebrities arrive on the booth. Komori Jun who was an ex-Popteen model in Japan is now 6mths pregnant. She is basically the Japanese version of Jordan but of course I very much suspect nobody beyond Japanese shores would know her! Currently a TV presenter, famous blogger and all-round super-idol for most Japanese girls, she spent 20mins looking, selecting and generally loving our maternity and baby clothes. With giggles, poses and introductions, our booth became THE place to be as the whole show practically came to a standstill to see her. As with all Japanese mums-to-be, she looked barely pregnant but adored us and then left the entire show as quickly as she’d arrived. So. 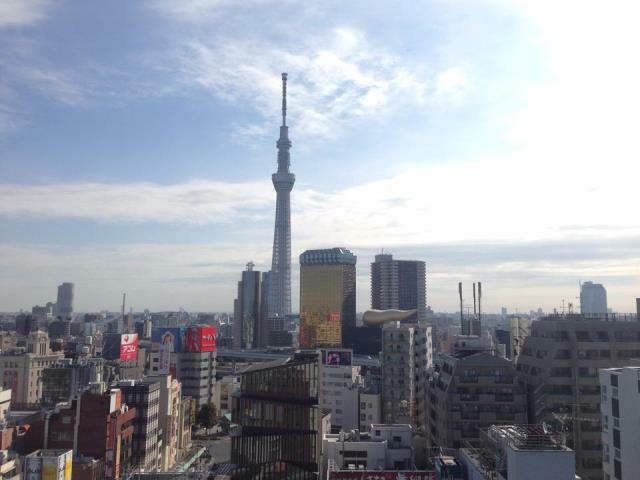 For any would be visitors – embrace the jetlag, the Jordans and Japan and you’ll have a great trip!